Safety Check Up – A Lucky Hut Trip! – Ullr Provides! My wife and I walked out of our first avalanche awareness class terrified and immediately reflected on a trip we took the year before the Fowler Hillard hut, part of the 10th mountain division hut systems. We humbly share this story, so you know we don’t always have things dialed. We also take full responsibility for our actions, and we should have prepared for the trip without reliance. Although we are avid campers and skiers, this trip would be my first winter hut trip and my wife’s first time snowshoeing, backpacking, or going to a hut. Needless to say, we were green and probably not ready for the challenge of this hut. We certainly didn’t know the risk, the actual gear list we needed, or human factor mistakes we were going to make. For context, the Fowler-Hilliard hut sits above treeline at 11,500 ft nestled just below the peak of Resolution Mountain near Leadville Colorado. It is extremely popular given it’s with easy access to intermediate and expert backcountry skiing, much of which is accessible right out the front door. Fowler-Hilliard also one of the more luxurious accommodations in the hut systems as it is also one of the newer builds. The hut comes stocked with padded mattresses, wood stoves & fuel, propane burners, all cookware and utensils, some games/puzzles/books, guitar, and sitting and eating areas. At full capacity, the hut sleeps up to 16 people. Given the remoteness, it is an incredible accommodation and one of the flagships of the hut system. Our friend had won the annual lottery that allowed him to reserve the entire hut. Since he paid the dues in full, his focus was to gather whoever could join us to keep cost minimal. Once we signed up, everyone invited received planning emails with a gear list, meal purchase focused, and the link to the Fowler-Hilliard description on huts.org. Avalanche beacon was listed in the gear list as optional “if you are skiing.” A shovel and probe were not on the list. For all we knew, snowshoeing was safe, so avalanche gear was not needed. Honestly, we assumed our friend would be the trip leader and quasi-guide on this adventure based on getting these details from him. Looking back and reflecting with our friend, his perspective was different, and the gear list was more friendly advice than outfitting for the adventure. It was unfair for us to make this assumption and we should have done more of our own research. Our friend has also recognized the impression and has updated his invite process, especially with newbies. 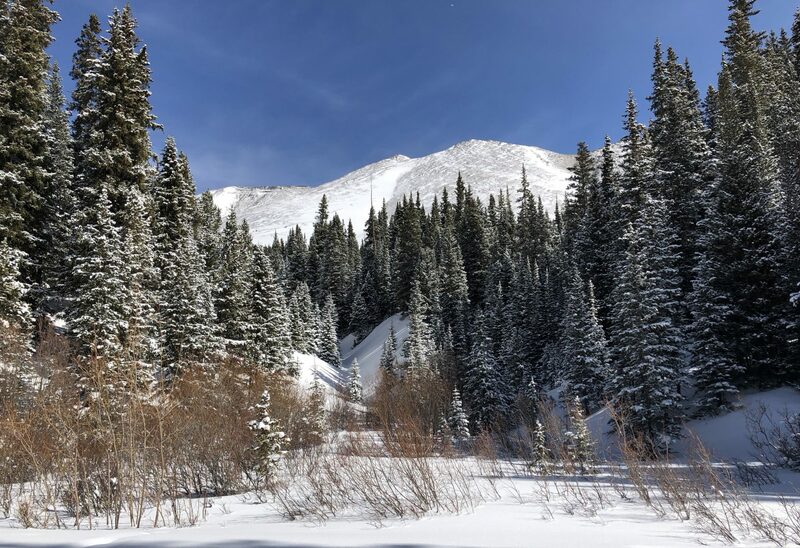 For those of us that had not been on snowshoes or using AT Skis with a pack on our back, we made a quick day trip to a favorite hike near Denver called Chief Mountain. This was beneficial for us to find some familiarity with the gear and what it would be like to carry some of our load uphill. In hindsight, we wish we would have taken the time to fully load our packs to really feel the weight we would carry for longer distance. We might have made some decisions on how to reduce what we took on the trip. This trip also enabled some of us to get to know each other a little bit. As the group needed to spread out on the narrow trail, it wasn’t the best environment to get to know everyone. Looking back, we probably should have planned for a happy hour to get to know each other even better, but it was better than nothing. The more you know about everyone on the trip, the more everyone can anticipate strengths, weaknesses, and communication styles. Unfortunately, this was a missed opportunity to introduce and discuss avalanche awareness. Any number of us could have brought the topic up. Editorially speaking, the huts.org website does not clearly identify the avalanche risks involved on the routes to Fowler Hilliard Hut and many other huts in the network. While the 10th Mountain Division Huts do include avalanche risk on a separate page as well as within their liability waiver filed before the trip, we think it could be cross-linked amongst the trail descriptions to trigger necessary awareness. The digital maps require user knowledge of CalTopo to turn on slope angle shading to see avalanche risk on route or adjacent to the route. In contrast, the Markley hut is very clear about the avalanche risk. Granted Markley hut is significantly more dangerous terrain, but my perception low risk of the danger to Fowler Hilliard Hut was skewed toward little to no risk mindset. This is a dangerous precedent to set. I’d much rather be aware, a little scared, and over-prepared versus the alternative and terrifying hindsight later. The next meeting that was held with the entire crew was the day before divvy up the food weight for the hike the next day. During which we learned it had decided to go via the McAllister Road route versus the more direct Resolution Creek trail based on the perceived abilities of the group. Unfortunately, We did not have a formal discussion about where people stood, ability levels, and experience. We should have known who we were going with, what buddy groups would be established and kept, and identified who the leaders were, and the communication protocols for all parties. Also with the late awareness of which route we would be taking much of the crew relied on the descriptions or, in my case, blind faith that others knew the route. On paper, the trail is about 6 miles and gain about 2500 vertical throughout the trip. After a relatively easy hike along the creek, the path turns sharply uphill, and you’ll feel the burn as you gain approximately 800 feet in a mile. While this climb just under a 30-degree slope (a critical angle for avalanches) on this section, it definitely seemed steeper in places. At the top of this section, you will be just above tree line for the rest of the journey for just over a mile before descending between cliffs to arrive at the hut. Its this final passage between cliffs and the bottom of the section ends in a terrain trap. The weather leading up to the hike had been unseasonably warm, but that night a storm was coming in. The next day was supposed to be clear again. Sounds nice? Turns out, these exact conditions are the most prone to human and natural avalanches. We learned later that both the steep climb and the terrain trap areas probably should have slid. At the time, I didn’t know what cracks looked like or the sound of a whoomph. In the end, we got there. No harm, no foul and no ill will towards either of my friends. We also met new friends and other backcountry enthusiasts. I did, however, felt obligated to apologize for being the liability on this trip. We all sat down, talked about what we learned, dialed in gear a little tighter, and became a better crew. The critical upshot, read and take an avalanche awareness course before heading out. If you are in the Denver area, many retail stores including Arcteryx, Bentgate Mountaineering, Feral, Neptune Mountaineering, and REI have classes that are typically free. Another fantastic resource is the Colorado Mountain Club. All of these have knowledgable resources that can help you plan your trip better. Additionally, you can consider other information sessions like backpacking 101, group dynamics, and meal planning to help you pack lighter, work together better and eat better on the trail. Bottom line, get the knowledge before you go!